Most neon tubes are made from lead or soda-lime glass tubing that is commercially manufactured and supplied in 4'-5' lengths. Commercial tubes come either in clear or colored glass and may be coated with special phosphor powders which contribute to the final color of the tube when it is lit. 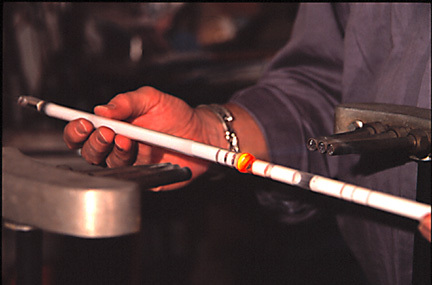 In some cases, the tubing is made from hand blown glass with the help of glassblowers at local hot glass studios. 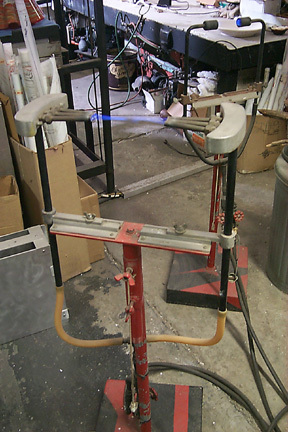 Once the neon tube has been bent and shaped to its desired form, it needs to be processed to enable it to be lit. 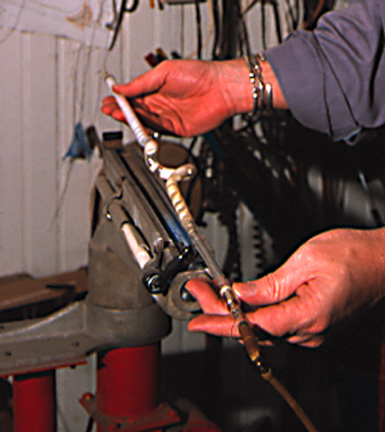 Processing a neon tube is is technically demanding as the process must by done absolutely correctly or the tube will fail to function properly. The new neon tube is first attached to a manifold, a system of tubes, stopcocks and gas flasks in conjunction with a powerful vacuum pump. 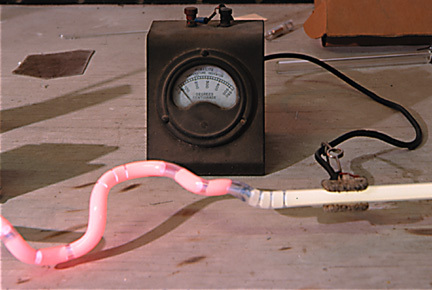 When the neon tube is perfectly sealed airtight to the manifold, a partial vacuum is introduced into the tube and a very high voltage current is applied to the tube, a process called "bombarding". This electrical current serves to heat the remaining air in the tube to just below the temperature at which the glass will begin to sag. Heating the tube in this way vaporizes whatever impurities, especially water, that have remained in the new neon tube. When the tube temperature reaches its maximum, approximately 200 degress centigrade, a full vacuum is applied to the tube to evacuate all remaining air and impurities from within the tube. 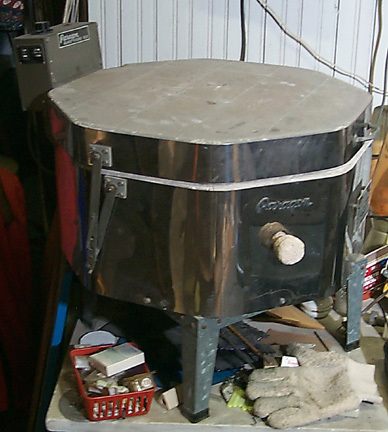 Only when the tube has been thoroughly evacuated can the neon or other inert gas be introduced into the tube via the manipulation of stopcocks and gas flasks. 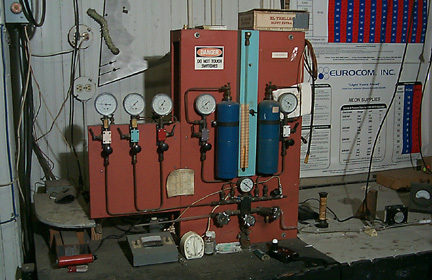 Once the gas is put into the tube at the appropriate pressure (still less than atmospheric pressure, a partial vacuum), the tube can be removed carefully from the manifold. The tube is now finished and ready to be used though it should be aged for a little while to allow the tube to mature. This processing of the tube not only requires careful attention to detail to provide a quality tube but also to ensure the safety of the individual processing the tube. 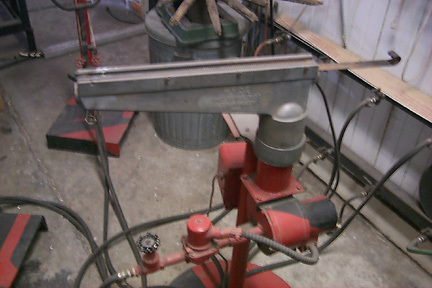 Voltages in excess of 10,000 volts are applied to the neon tube during processing and a careless error in this stage can be fatal to the operator. It should be pointed out that such dangerous voltages are used only in the processing of a neon tube and not in the neon sculpture! From its inception at design to its final manifestation as a luminous sculpture, each neon tube is hand made and processed individually with careful attention to detail. Our studio takes pride in the quality of work generated with the expectation that it will provide years of trouble free service. In addition to neon tubing, Ehlenberger uses other glass in his work as well. Working with glassblower, who blows the glass Jellyfish bodies as well as parts of the Venusian Swamp Flowers, Ehlenberger incorporates blown glass in his sculpture. In addition to the blown glass, the artist also heats glass in a kiln, to slump and fuse glass together as seen in the Borealis and Muhyo.